Lacquerhead Polish Pleasure Town is a baby pink crelly polish with a mix of pink, purple and blue pastel glitters in square, shard and star glitter form. It also contains pastel yellow shards and white circle glitter. I love how delicate it looks and it took 3 coats to become opaque. It dries very quickly so if you keep brushing at it too long on the nail it will pull and become uneven. A drop of nail polish thinner can probably remedy this but I decided to apply it quickly instead. I love how cute the Lacquerhead Polish bottles look with the ribbon bow on the cap. I decided to sponge on Lacquerhead Polish Slumber Party in order to achieve an opaque effect (see glitter sponging tutorial here). I used nail guides in order to achieve the effect above on the pinky and a ring binder reinforcement sticker to achieve the effect on the ring finger. 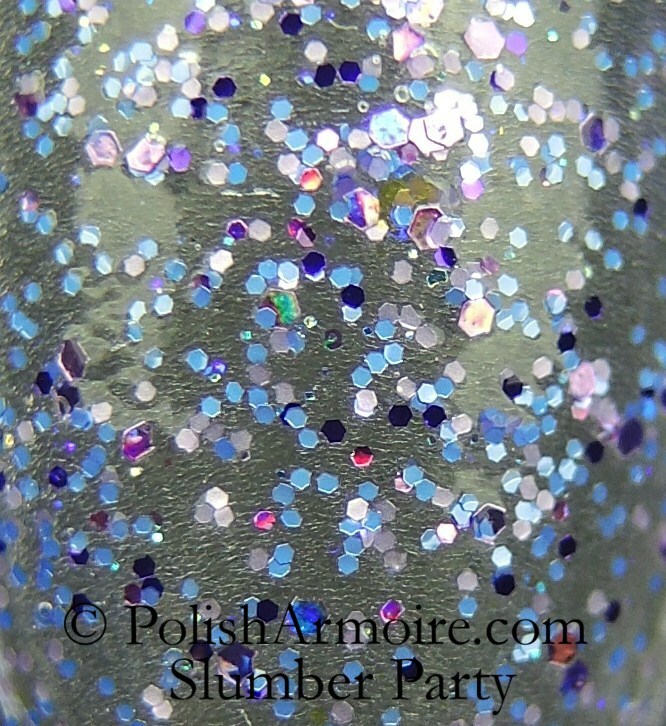 Slumber party is a mix of small purple, blue and pink glitter with larger holo hexes and squares in a clear base. The overall colour of this polish leans between either blurple or purple depending on the lighting. The photos I took here leaned more towards blurple. A macro shot of what one coat of this polish looks like is below (excuse the weird lines in the background, I’m not sure why my swatch sticks react that way with certain polishes). Tags: Crelly, Glitter, Gradient, Nail Art, Sponged Glitter Gradient. Bookmark the permalink.